On our most recent trip to Disney World this May, we decided to check out some of the new bars that have made their way to the resort since our last visit. Given our love of all things "Adventureland," Jock Lindsey's Hangar Bar made the list with its Indiana Jones theming and exotic cocktails. 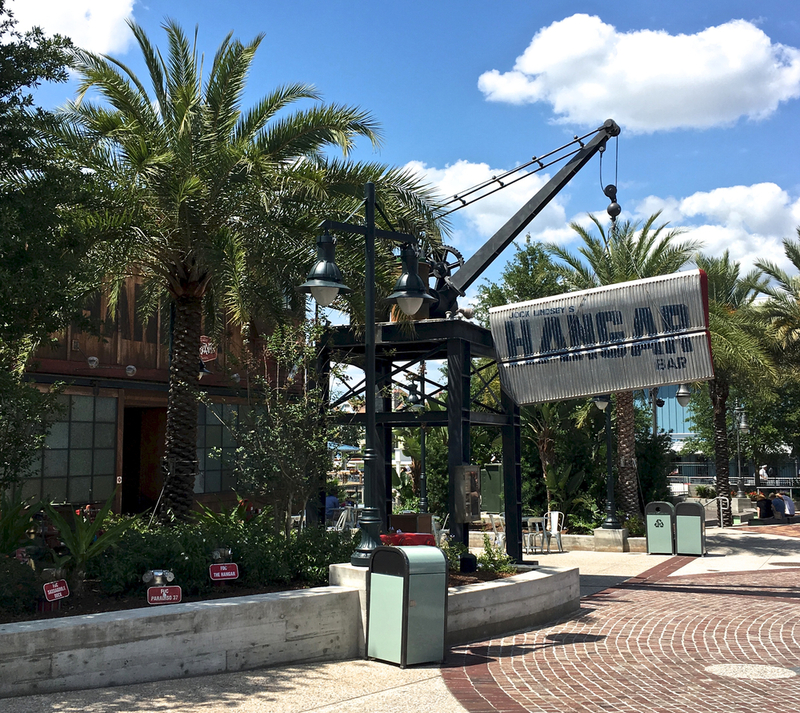 It's one of many new additions to the recently renovated Disney Springs area (previously known as Downtown Disney). We had expected this bar to be similar to Trader Sam's (dark and with parts of the bar that come to life) but found it to be much more bright, airy, and mellow. It's situated on the water and has lots of outdoor seating. We chose to sit inside so we could really soak up the theming and decor. For drinks, we ordered two Pisco-based cocktails that looked refreshing without being overly sweet. Greg ordered the Bitter Barkeep (pictured below). And I ordered the Hovito Mojito (below). We both really enjoyed our drinks. I particularly liked the presentation of mine and would have liked to bring home the glass if possible. While many souvenir mugs and cups are available to purchase, this was unfortunately not one of them. I did get to keep my poison dart swizzle stick though! In terms of food, the menu wasn't as extensive as I had expected but it still had some unique looking items to try. We decided to go with Brody's Brats and Air Pirate's Pretzels (which came with mustard and a delicious beer cheese fondue). Everything tasted great but we have to say the pretzels were more of a bagel/roll/pretzel combo. We liked them and loved the cheese sauce they came with but it's worth noting that they're less like pretzels than you'd imagine! We could have stuck around longer to try more items off the menu but we wanted to save room for our next stop: Trader Sam's Grog Grotto. Can't wait to visit again next time! 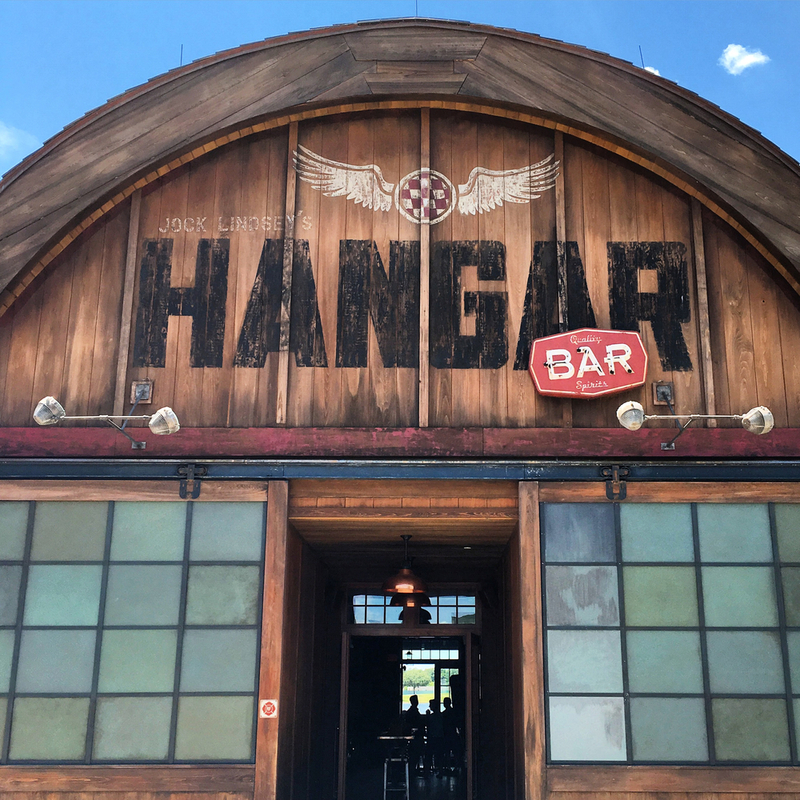 Have you visited Jock Lindsey's Hangar Bar? Let us know about your favorite food & drinks you tried there and we'll be sure to check them out on our next visit!